Geographic location: Pezinok is located 18 km north-east from Slovak capital Bratislava, 156 meters above sea level, its territory is 7 276 ha, it lies at the foot of a mountain range - The Small Carpathy. 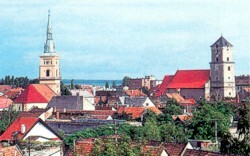 Population of Pezinok: 22 143 inhabitants. Travel connection: State roads No. II/502 and 503 pass trough Pezinok as well as rail line No. 120. Pezinok is an old winery town surrounded by slopes of a mountain range Small Carpathy which have played an important role in its history. It was the Small Carpathian mountain which provides valuable resources for native inhabitants of Pezinok. The town is attractive for tourists and everyday visitors due to its proximity to the nation's capital Bratislava, as well as easily accessibility by both road transportation and trains. Vintner traditions are still alive and the town is well-known for a prosperous brickmaking and prodution of pottery. Wine production and wine making have had a tremendous impact on the livestyle of the people. Basides gold mining, whitch already disappeared there is s prosperous brickmaking and production of pottery. Other important economic sectors in the town include construction, trade and small craft production. An interesting place for all sports lovers in Small Carpathy is the ski resort on the hill of Baba. In the summer many tourists go hiking on a number of marked tourist paths. All city forests are a part of a natural protected area Smal Carpathy. Beech and oak trees are most widely spread in this area.